Getting married in NYC means having access to hundreds (if not thousands) of wedding venues! No really, there are so many to choose from you may find it hard to make a decision. From rustic wedding venues and intimate restaurants to New York rooftop wedding venues options, there is something for everyone! 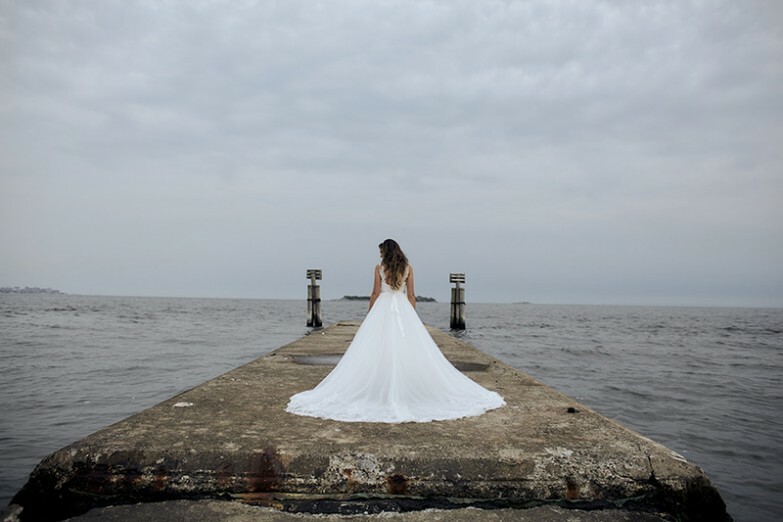 But if exchanging vows by the waterside is your thing, New York is home to some of the most breathtaking waterfront wedding venues in the Tristate area and our photographers and video team have shot at most of them! It’s no secret that our Brooklyn photographers and video team are a bit partial to Brooklyn-based venues. 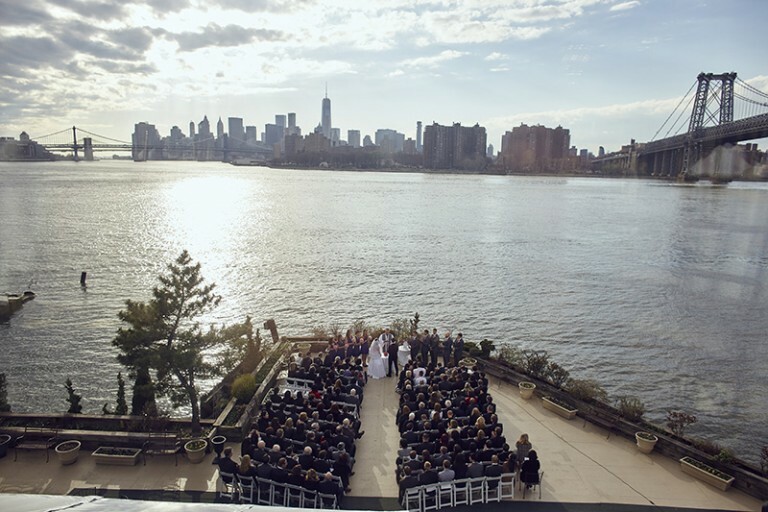 The hip NYC borough offers unique wedding venues including waterfront spaces that are perfect for larger and intimate weddings. Giando on the Water, in Williamsburg is a premier Italian restaurant and and one of the best Brooklyn-based wedding venues with a view. The wedding venue offers couples an unmatched waterside option with indoor and outdoor space for your ceremony and reception and views of the skyline. Our photography and video studio is one of their preferred vendors and love shooting there! Be sure to add our affordable and fun photo booth to your wedding package for this Brooklyn venue for even more fun on the water (they have covered area on the patio that is perfect for the photobooth). If you prefer a waterfront venue with an industrial feel, The Liberty Warehouse in the Red Hook section of Brooklyn may be the right choice. Located right on the water’s edge, with views of the Statue of Liberty, Verrazano Bridge and New York harbor this Brooklyn venue can accommodate up to 1200 guest for a cocktail style reception. Our photographers have shot at this venue several times and the photos always come out amazing! Brooklyn is also home to several other waterfront spaces and venues with water views like The W Loft (a waterside rooftop wedding venue), The Greenpoint Loft , a rustic water front venue and Dumbo Loft which is a block away from the Brooklyn Bridge Park. Completely surrounded by water, Manhattan offers several waterfront wedding venue options. The Water Club, an upscale wedding venue docked right on the east river, offers a unique waterside experience for your wedding day. The venue offers three private rooms for your wedding with large windows so your guests can enjoy panoramic views of the East River. The photos at this beautiful venue are always perfect and our photography and video studio is listed on their best vendors list. 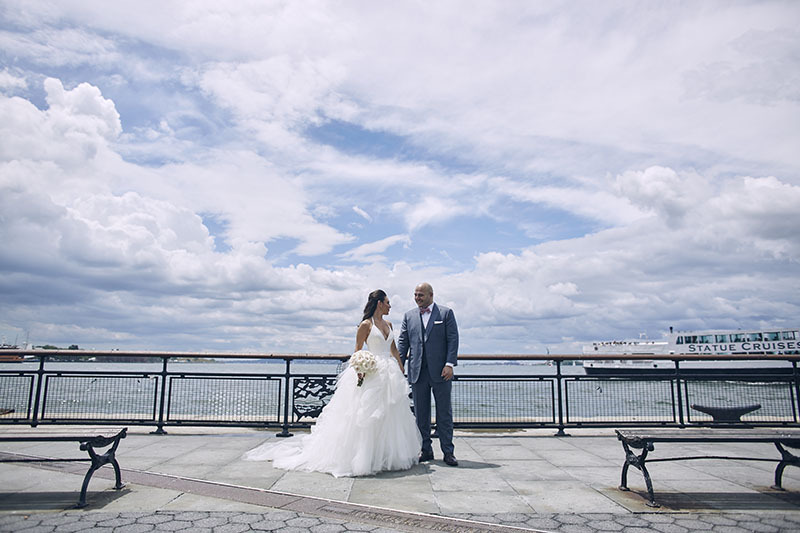 Another option in downtown Manhattan is Battery Gardens wedding venue in the popular Battery Park . A favorite for places to take wedding pictures in NYC, Battery Park offers couples unobstructed water views of the Statue of Liberty and East River with indoor and outdoor space for your ceremony. Our photographers have captured everything from elopement photos to engagement shoots in this popular park! A few other wedding venues with a view worth considering in Manhattan are Sunset Terrace and The Lighthouse at Chelsie Piers , Ramscale Studio (a rooftop venue with water views) and, if you are looking for a historic venue surrounded by water ,Ellis Island! Our “forgotten NYC borough” of Staten Island is worth remembering when looking for a waterfront venue. A quick ferry ride or drive across the Verazanno Bridge and you and your guest can enjoy breathtaking views of the water and affordable venue options. The Vanderbilt at South Beach is the perfect choice for couples who want easy access to the waterfront and a traditional wedding venue reception hall. The waterside venue has a private beach for your ceremony and also offer several menu choices. Our photographer and videographer have shot here several times and captured breathtaking photo and video! While Long Island is known for it’s beaches it is also home to several waterfront venues including the Bridgeview Yacht Club. The wedding venue host one wedding at a time giving couples and their guests personalized attention. The venue sits right on the water with amazing views.